Jalousie is a French word, meaning louvers. It’s also the technical name of this week’s dish. But I have given it an American twist, used my writer’s prerogative, and renamed it. This new recipe is now called “Saloon Doors”. I learn the oddest and most arcane things writing these essays each week. I should rent myself out for trivia games. For today’s topic I did a little research on those swinging louvered doors festooning saloon entrances in Western movies. And discovered they’re pretty much a Hollywood invention. Think about it, having half doors swinging in the wind would have been a horrible idea for someplace like Montana in January. And using those doors would have left no manner of securing the saloon when closed—which it did for at least a few hours every day (Miss Kitty needs her sleep, y’all). But they make for very dramatic entrances of black-hatted villains and white-hatted heroes into the saloon and thus Tinsel Town has implanted them irrevocably into our collective psyche. Anyway, back to my own, edible, clichéd, saloon doors. The recipe calls for puff pastry, manipulated, stuffed and baked. So once you know the procedure, you can fill it to your taste and occasion. As a jumping-off place I’ll give you four ideas for filling; breakfast, lunch, dinner, and dessert. Where you go from there is up to you. This recipe is made with frozen puff pastry, found in most supermarkets, and made by layering dough with butter, rolling, and refolding, countless times. This gives it up to a thousand layers. The water in the butter evaporates while baking. This produces steam which gives the puff. I offer a few pieces of advice. 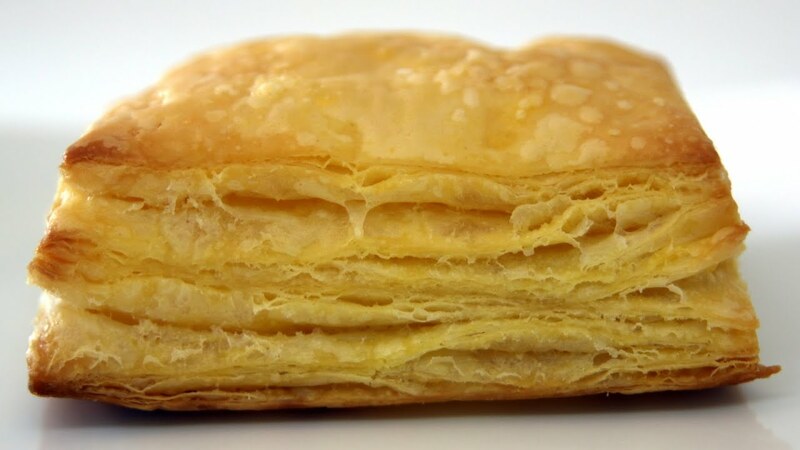 Try to purchase all-butter pastry; it tastes and cooks better. Let it thaw overnight in the fridge, or if not possible, on the counter until it can be unfolded and worked. If you seal the edges, you will not get left. So don’t get egg wash on them; it’ll glue them shut. When cutting; cut, don’t press. When sealing the two pieces, be gentle. Egg wash, then cut the slats, so the steam can escape. Cut each sheet in half. Lay out two pieces on parchment-lined cookie sheet. Spread filling on each, leaving a ¾ inch border. Brush beaten egg on naked border. Fill. Top each piece with the other sheet. Lightly press border to seal. Brush egg on top layer. Leaving ¾ inch border, cut 1-inch horizontal slats down the length of each piece. Bake at 425 until the pastry begins to brown and puff. Lower oven to 375 and bake until dough is dry, crisp and deep golden-brown. Slice and serve. Makes 4-6 servings. Scramble 10 eggs. Season. Cook 6 slices bacon until crisp. Spread eggs onto bottom sheets of pastry, leaving ¾ inch border. Sprinkle on crumbled bacon and chopped fresh parsley. Top with pinched off pieces of goat or Boursin cheese. Cover with second piece, brush with egg wash, and cut slats, leaving border. Bake according to directions above. Sauté leeks and mushrooms until browned and dry. Spread on pastry. Sprinkle on julienned prosciutto. Using a potato peeler, scrape ribbons of Parmesan cheese over top. Lay on top pastry, prepare, and bake. Spread thin layer of pesto on bottom of sheets. Cover with shredded rotisserie chicken. Dot with sun-dried tomatoes and mozzarella cheese bits. Finish and bake. Spread half of a jar of black cherry preserves on each sheet. Cut one 8-ounce block of cream cheese into small squares. Top preserves with cream cheese, and dot with toasted, chopped pecans. Cover, finish, and bake. Sprinkle cooled tart with powdered sugar, and serve with whipped cream, or ice cream. These are easy, but look impressive. If you often have unexpected guests, it’s not a bad idea to keep a box of puff pastry in your freezer. You could fill them with anything that you have on hand. And when you carry out one of these puppies they’ll be so fancy looking, you’ll make Martha Stewart look like a slacker.